Assam girl Hima Das scripted history on Thursday by becoming the first ever Indian woman to win gold at the IAAF World Under-20 Athletics Championships as she clinched the top spot in the women’s 400m final race on the third day of the competitions at Tampere in Finland. A report published in The Economic Times stated that the 18-year-old Das, a pre-tournament favourite, clocked 51.46 seconds to win the gold. Hima, who hails from Dhing in Nagaon district, is the first Indian track athlete to have won a medal in the history of this competition. The President of India, Ram Nath Kovind, congratulated Hima, on her achievement. Kovind tweeted, Congratulations to our sensational sprint star Hima Das for winning the 400 m gold in the World Under-20 Championship. This is India’s first ever track gold in a World Championship. A very proud moment for Assam and India, Hima; now the Olympic podium beckons! #PresidentKovind. 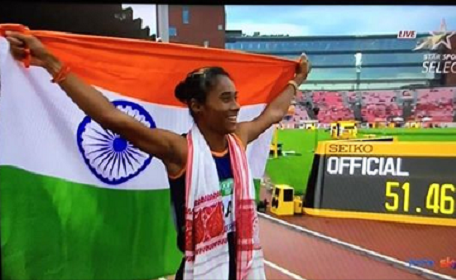 The Chief Minister of Assam, Sarbananda Sonowal, has also congratulated the 18-year-old sprint queen. The report further stated that Hima clocked an Indian U-20 record of 51.32 seconds to finish sixth in the Commonwealth Games 400 m final in Gold Coast in April this year. She now joins the illustrious company of star javelin thrower Neeraj Chopra, who won gold in Poland in the last edition in 2016 in a world record effort. The 18-year old had clocked an Indian U-20 record of 51.32 seconds to finish sixth in the Commonwealth Games 400 m final in Gold Coast in April. Since then, she has gone onto improving her timings. She lowered the Indian U-20 record in 400 m to 51.13 seconds while winning gold in the recent National Inter State Championships in Guwahati.